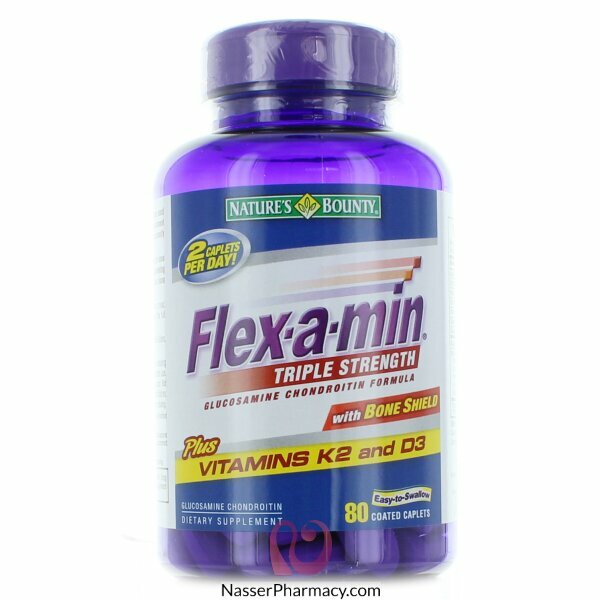 The makers of Flex-a-min have created a Triple Strength formula that includes Vitamin K2 and Vitamin D3, in addition to the naturally sourced ingredient Glucosamine. Flex-a-min Triple Strength helps to provide extra cushioning and lubrication for your joints. Bone Shield contains a natural form of Vitamin K2, which is important for bone health, but not readily found in the diet. Vitamin K2 is an active form of Vitamin K that works by activating enzymes that are responsible for bone formation—helping to maintain bone mass and strength. 1. This statement is based on two human studies of Aflapin using subjective measures in which participants rate their joint health. In these studies, after 7 days, improvement continued to be seen, including in biomarker analysis. Glucosamine HCL - Glucosamine is a key component of cartilage. Vitamin D- Is involved in proper bone mineralization and helps maintain healthy bones in adults. For adults, take two (2) caplets daily, preferably with a meal. Take this product with plenty of fluids. For best results, take the full dosage of Flex-a-min daily.